Enter to win! No purchase necessary! We’re giving away a prize bundle designed to help those with incontinence Get On With Life! As part of our monthly family caregiver sweepstakes, we’re giving away a case of TENA® incontinence products and Heaven Scent® versatile disposal bags. Enter to win this prize bundle — with no purchase necessary and no strings attached! 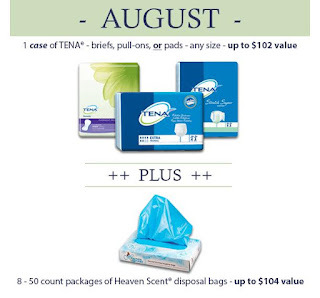 One case of TENA disposable, absorbent briefs, pull-ons or pads: The winner gets to choose from three styles of TENA disposable absorbent products in any size. One of its most popular brands, TENA provides a full range of absorbent products for men and women. They’re designed with advanced odor and wetness protection and the comfort of regular underwear. This prize is valued at up to $102. Eight 50-count packages of versatile Heaven Scent disposal bags: Powder-scented, opaque bags mask unpleasant odors, making them perfect for disposing of incontinence or feminine hygiene products, pet pick-up, baby diapers and more. They’re generously sized at 8”x4½”x14”, yet small enough to discreetly stash in a purse or pocket. The winner receives eight packs, each with 50 bags, together valued at up to $104.